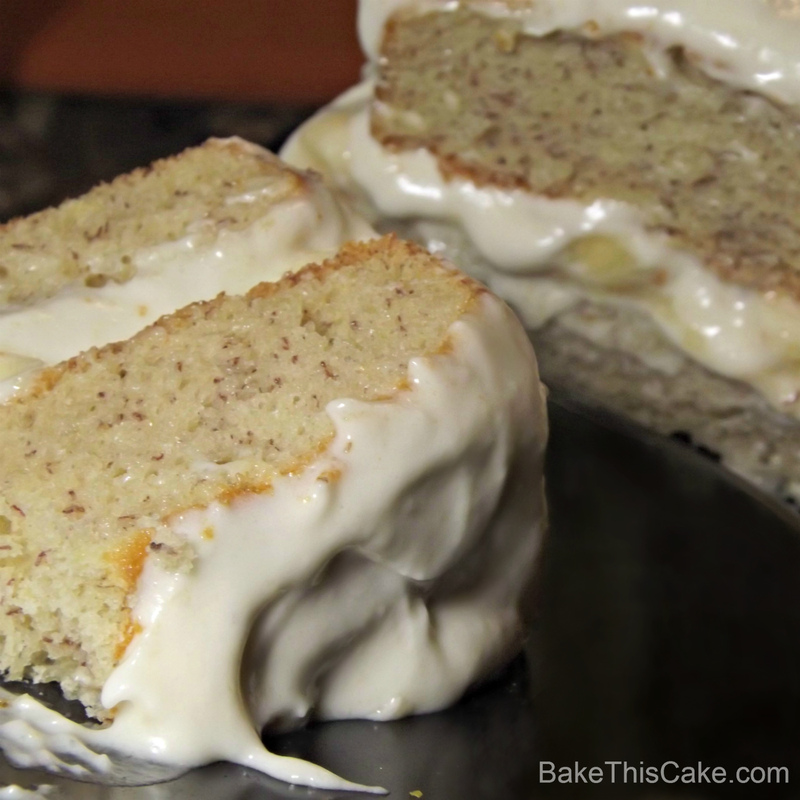 Fresh Banana Frosting Recipe for Betty’s Banana Layer Cake | Bake This Cake! 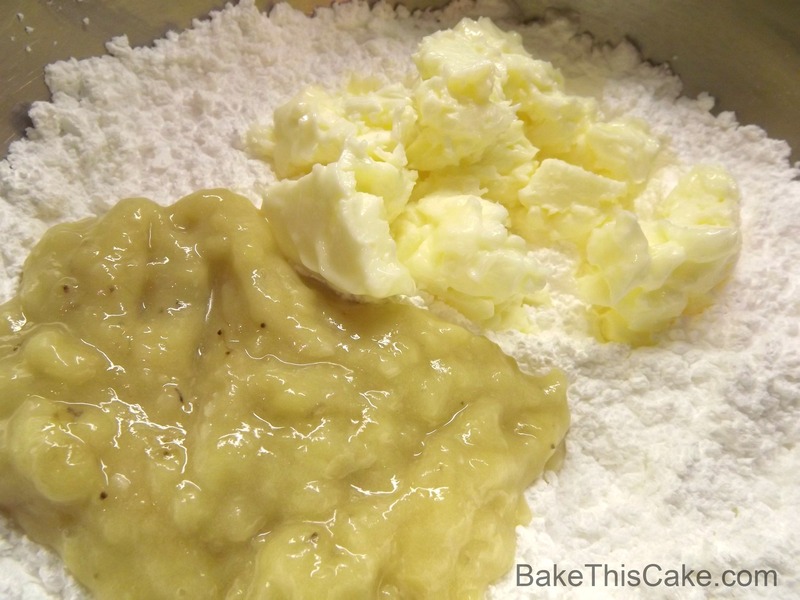 One of our Facebook guests suggested Banana Buttercream Frosting (thank you to pro baker, Joanna Caujolle-Hall!) to spread on our famous Banana Layer Cake and I think that was the best idea for this little charmer of a cake! Talk about doubling (or tripling) up the fresh flavors — with bananas in the cake, bananas in the frosting and bananas between the layers! whoa! 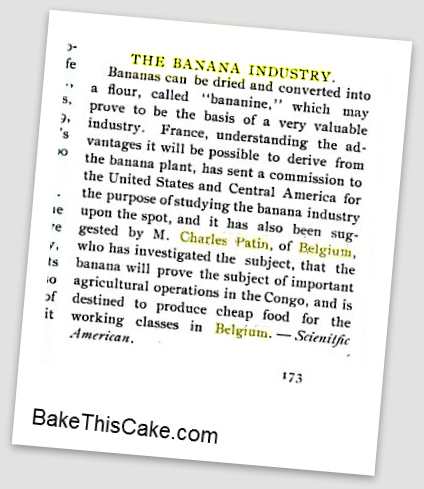 We’re using the 1940 “Banana Frosting” recipe in “The Culinary Arts Institute Encyclopedia of Cooking and Homemaking” via Pamphlet #3 edited by Frances Troy Northcross. Even back in 1897, when this article appeared in “Food, Home and Gardens” (Vols 1-3, p 173), reciting a discussion in Scientific American, the world knew that bananas were comin’ on strong and here to stay. I just know I LUV EM and I think they might be one of nature’s most amazing and perfect fruits. Get a Feel for the Banana Ripeness Factor! We’re using one spotted ripe banana for this little frosting project so, if your banana is not ripe, maybe you could try putting it out in the sunny garden for a bit or putting it in a bag with a little slice of apple to try to ripen it. 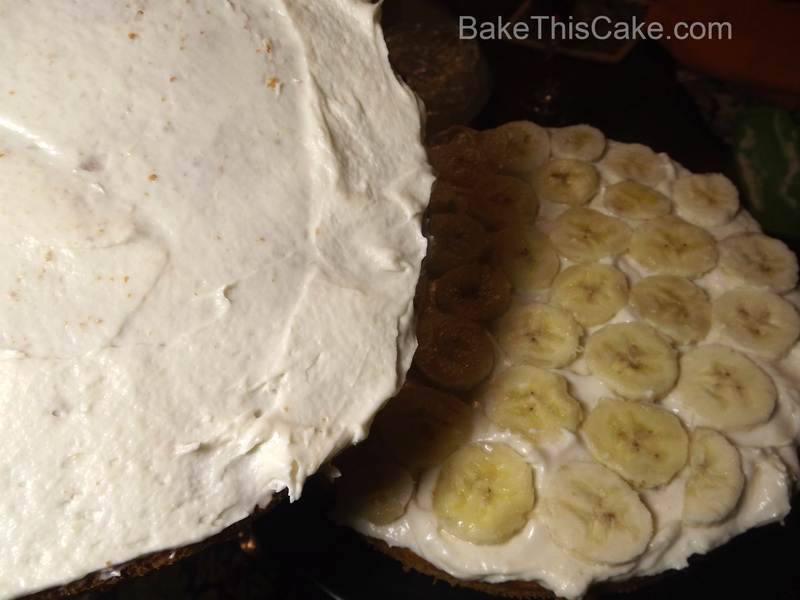 We’re also using a few “regular” bananas for the center filling. So check out your bananas and get them spot on (get it?) if you can…or what the heck, just go with what you have. haha! 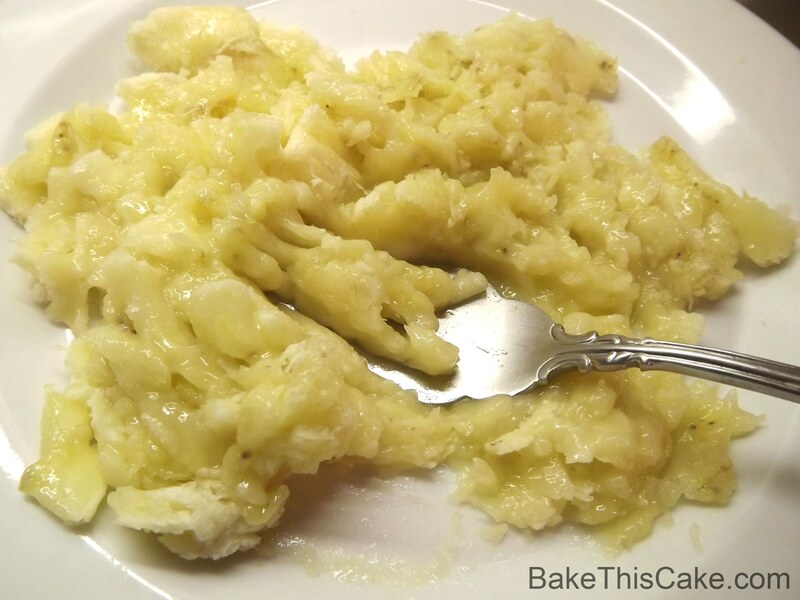 Mash a large banana well with a fork, remembering that every little chunk of fruit will show in the final frosting but hoping for some tiny bits to prove it up as the real deal. haha! 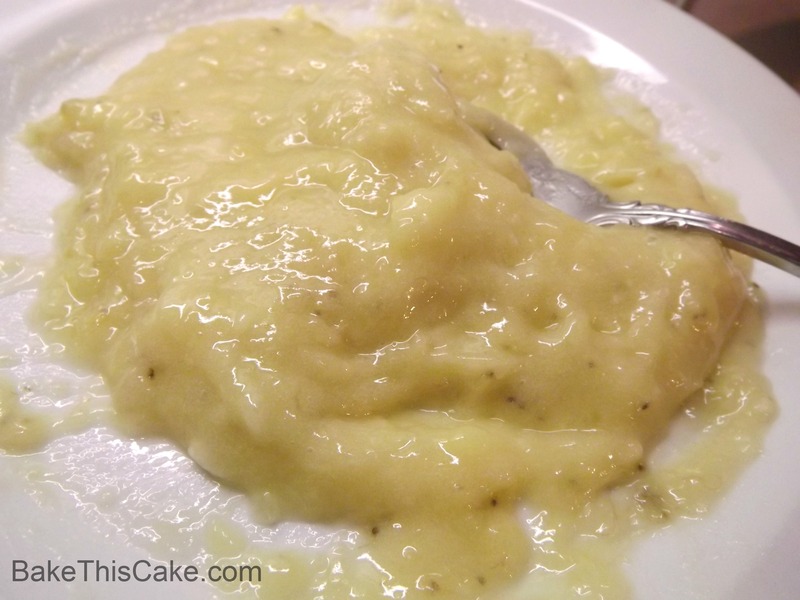 If the banana was ripe there should be some little black flecks in the puree. 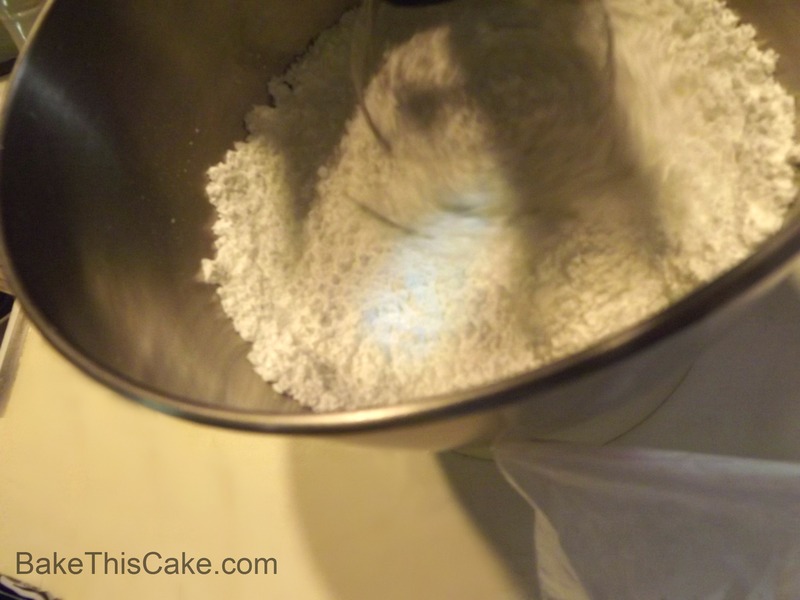 The lazy way to sift powdered sugar is by beating it for a few seconds in the mixer. ha! So, unless you want to be sifting this powdered sugar, give it a 30-second whir with the electric mixer. 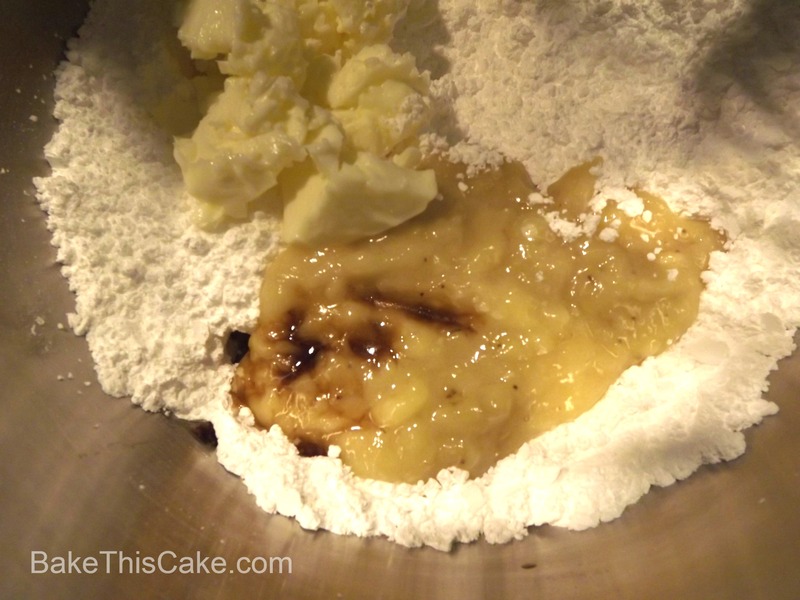 Add the room temp butter and banana puree to the powdered sugar in the mixing bowl. Now taste it to be sure you have the consistency and flavor that you like. If it is too sweet for you, you could add a little more cream cheese. 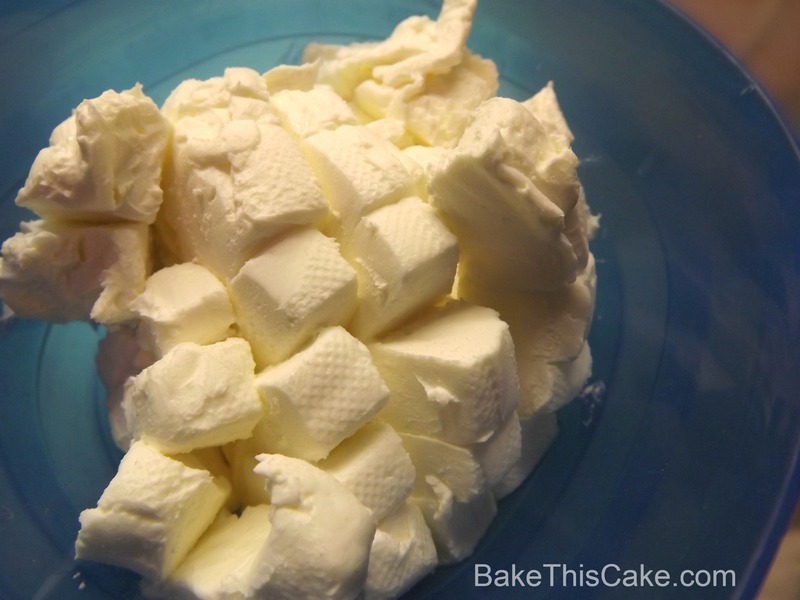 I don’t think it will need more sweetening, but since the original recipe does not have the lemon and cream cheese, you could add in some more powdered sugar to taste (that you should sift into the bowl with a little strainer to be sure it doesn’t cause lumping). 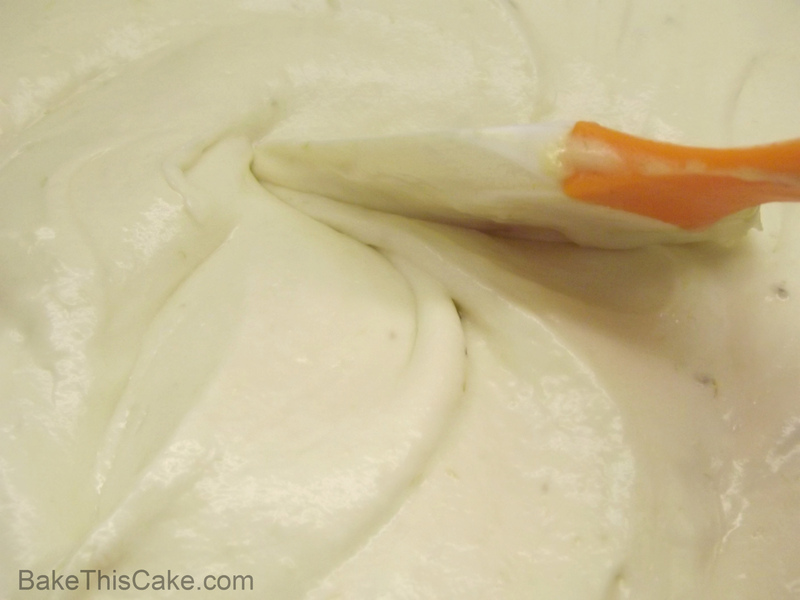 Here is the spreading consistency in a close-up of the frosting…. Let’s Fill and Frost This Baby! 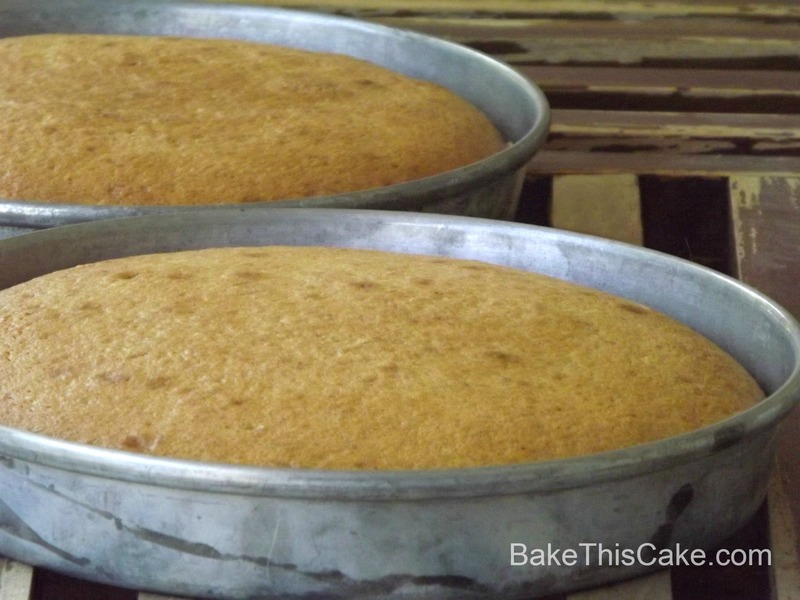 Make sure the banana cake is cool and the bottom layer cake is level before frosting. Cut away any hump on the bottom layer by slicing it away (and saving it for morning coffee snacks, yum-o!). I like leaving the top cake with a little gentle mound (but you can cut that away too if you want a perfectly flat topped cake. 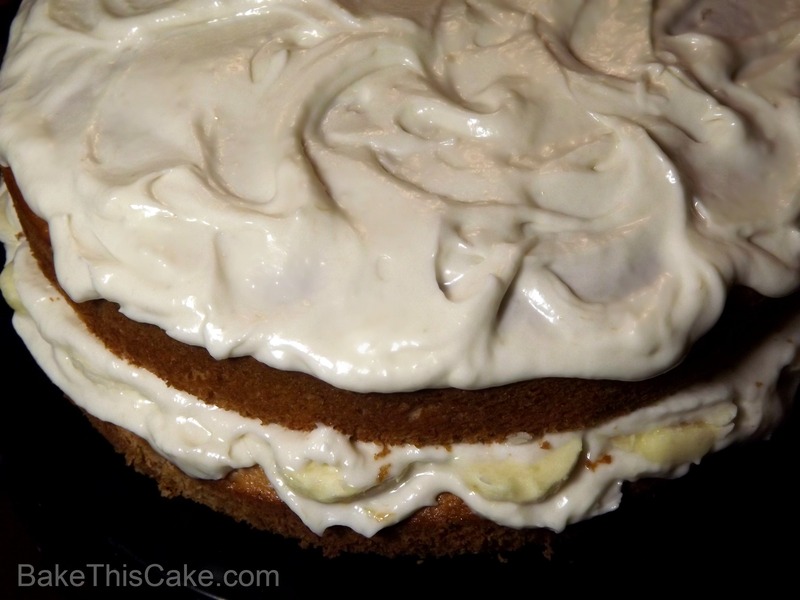 Spread a layer of banana frosting on the bottom layer about 1/4 inch thick. Now we’re using a few fresh bananas that are not overly ripe for the center filling (and maybe some on the top if you like that idea). 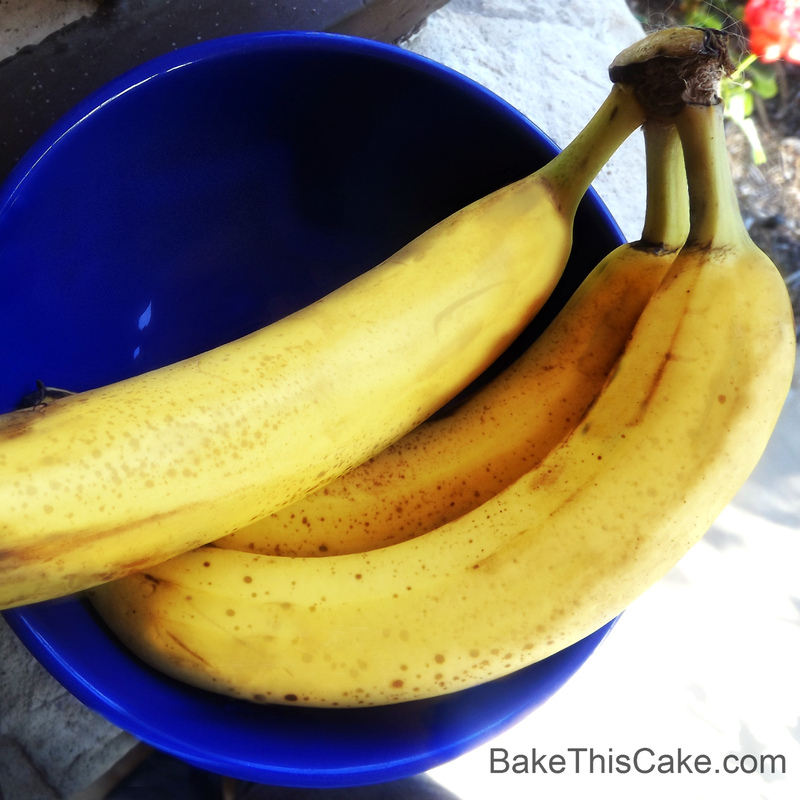 Slice about 2 or 3 fresh bananas and push them very gently into the frosting that you’ve spread on the bottom layer of the cake. 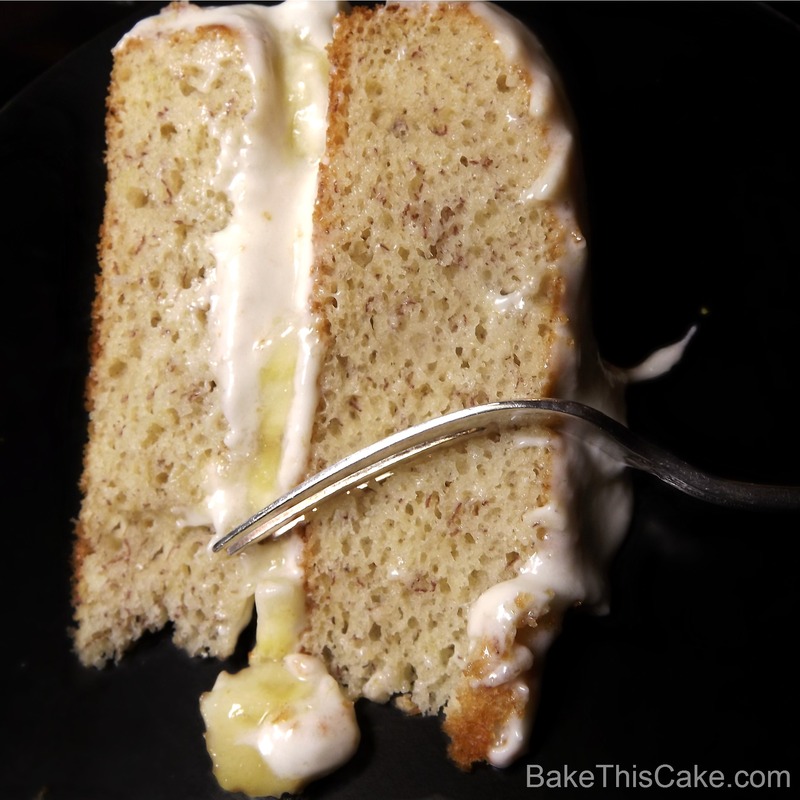 If you are doing a “bare sides cake” without frosting the entire cake, spread a thin layer of frosting over the BOTTOM of the top layer and set it on top of the frosted banana slices layer. Frosting to frosting, as they say. 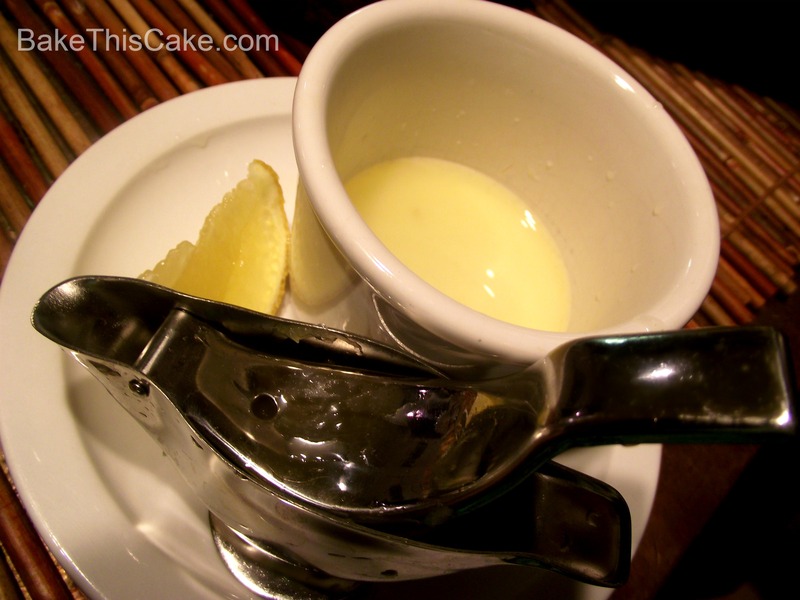 This will ensure that the two cakes stay together when you’re serving, otherwise, they might separate on the plate. 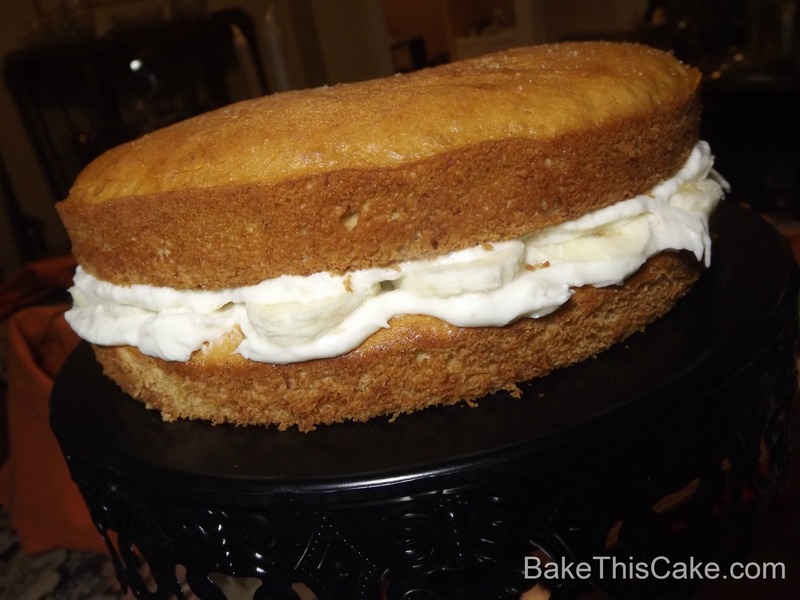 Gently push down on the top cake to be sure the banana slices become enveloped in yummy fresh frosting. Go ahead! Let them droop out over the sides a bit for an extra yum factor! Spread the top of the cake with frosting. I like to see a little cake and I think it looks a tad more charming in an old-fashioned way with the sides “open for viewing”. haha! You could even add some more banana slices to the top or a few at just top center for a little more cuteness. 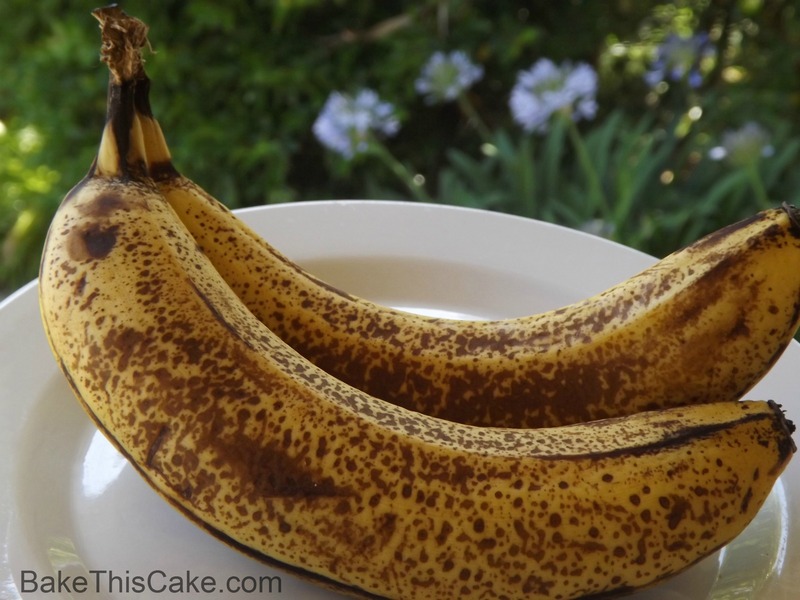 Because top-side bananas might turn brownish on you, you should only add top banana slices if you are going to serve the cake immediately (or you could try adding a few drops of fresh lemon juice mixed with a little powdered sugar to help keep any top slices of banana from going brown). 😀 If you have any other tips for keeping banana slices from going brown, please let us know in the Comments Section. Thanks! I hope you’ll find this vintage cake deliciously moist and vibrant and a total throw-back to the early part of the American baking scene that keeps on giving — right up to modern day table time! Thank you so much for joining me with our little DIY frosting party. I hope you’ll bake and frost one of your own vintage banana layer cakes and let me know how it goes. 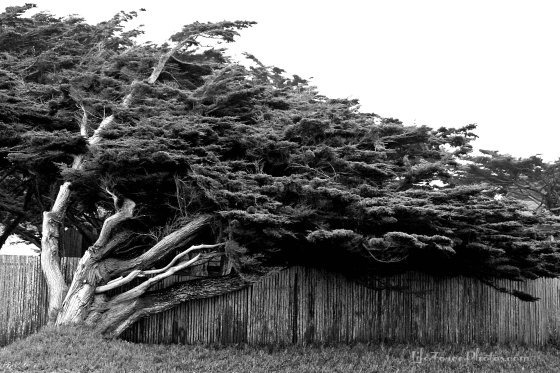 If you snap photos, show us your work on our Facebook page. You had a recipe for banana icing made with banana instant pudding. Could you please email me the recipe. Sorry I don’t have a recipe like that. We do mostly vintage and historic recipes. Happy hunting! For her 4th birthday, my daughter requested a “chocolate cake with banana frosting”. 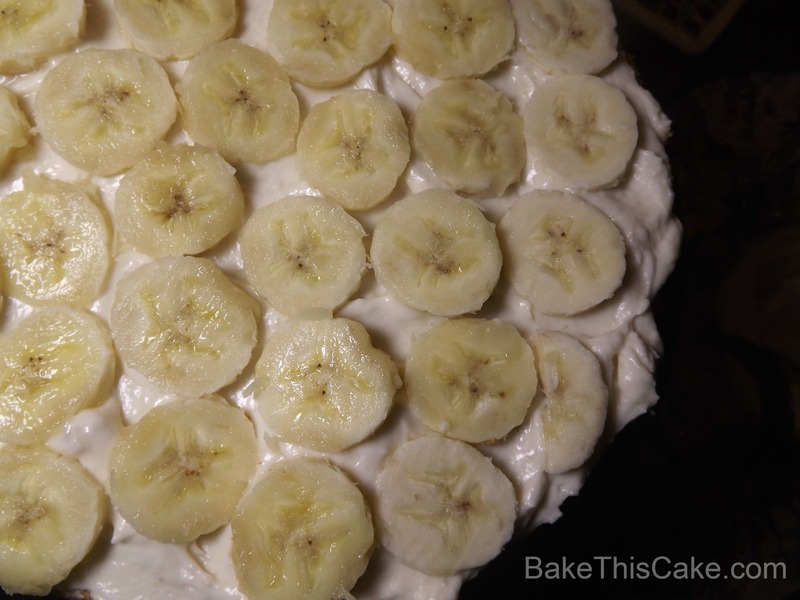 I enjoy a good challenge and appreciated finding this recipe for banana frosting, which I followed to a T (typically I don’t like to follow directions — which can be dangerous when baking). It was delightful. Most importantly, the birthday girl loved her cake! Leftovers kept well in the fridge for almost a week. Thank you for the recipe. Hi Leslie: I just found your recipe for Banana Cake after searching the web. FYI: The lemon juice was omitted as an ingredient in the cake recipe, but it is noted in the directions to make the cake. Regarding questions about runny frosting: Confectioners sugar gets runny when it comes into contact with water (fruit, fruit juice, pumpkin, liquor, flavor extracts, butter and cream cheese). So, you have to eliminate as much water as possible from the ingredients. The following recipe works 95% of the time if you remove water from cheese. Frosting will stay stiff all day and shouldn’t melt. Recipe: 8 oz. 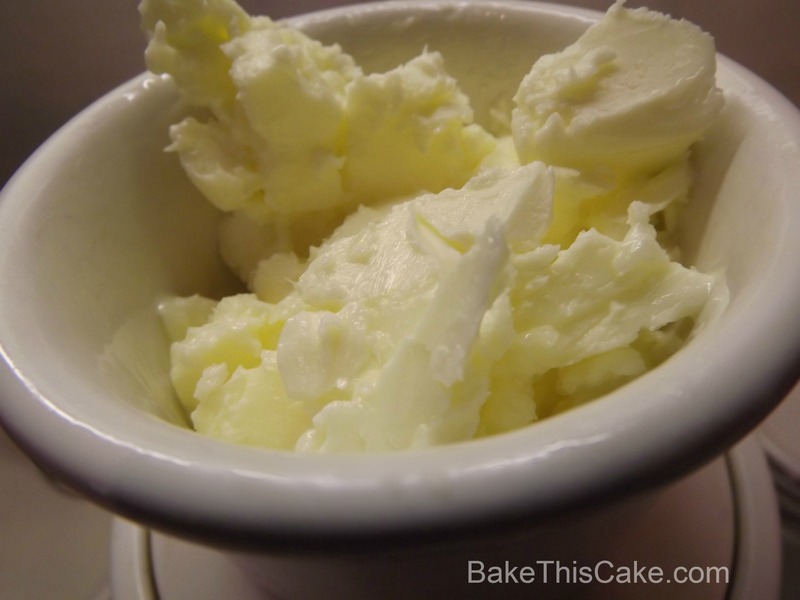 softened cream cheese, 1 stick softened butter, 1 tsp. flavor extract and 4 cups confectioners sugar. Beat ingredients until blended, but do not whip! 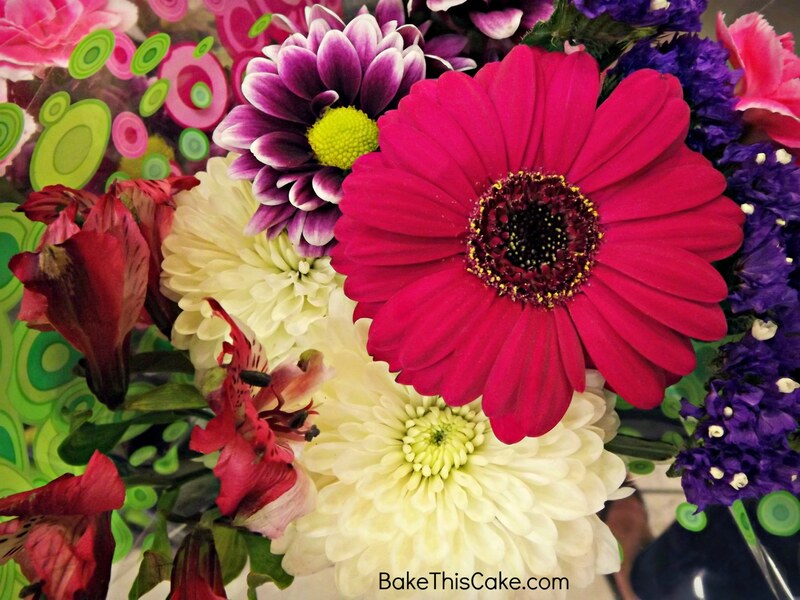 If it’s warm and frosting starts to thin, refrigerate before using. Hi Leslie, you had me at Vintage recipe. I love bananas and enjoyed baking for my friends and love ones. The cake is moist but I would love to use less sugar perhaps half do you have any recommendations? I did use the lemon and still was too sweet, I also tried adding the entire 8 oz of cream cheese. Any suggestions is greatly appreciated. Thanks in advance. I followed the directions to this cake but didn’t like how it came out. It came out too dense and very heavy. I think there’s too many bananas and eggs in it and that’s why it came out so dense. Sorry I won’t be making this again. Not sure if this will work with bananas I’m guessing it would. Dip them in 7up to prevent them from going brown. I do this when I make Waldorf salad on the apples, those apples stayed crisp for 2 days and never got dark. Having a dinner party tomorrow night to commemorate the 74th anniversary of the Doolittle Raiders. 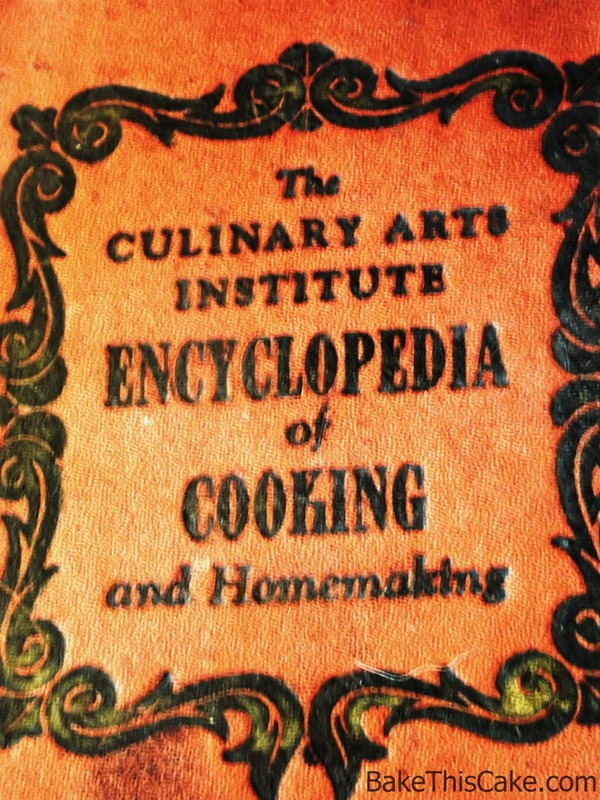 Most recipes I am using are from the 1940’s. I am sure this cake will be a big hit! Made the cake and frosting for a Bake Off at my son’s elementary school and it was a great hit! Unfortunately it was all gone before we had a chance to try it ourselves but hubby requested I make it again tomorrow so we can have some for the week. Thank you for sharing this delicious recipe! It was really easy too, your directions were easy to follow. Btw, per your tips in the directions, i checked the cake at 20 min and they were done right at that time. Oh and we got 1st place! The flavor is phenomenal but my frosting is a little runny. Maybe less banana. I put it in the fridge to firm up considering the butter and cream cheese were softened. I could just eat the frosting with a spoon and be happy! I would have added more powdered sugar but, ugh… I didn’t have anymore in the house! Cant wait to eat!!!! Omg I can’t stop eating this frosting, it’s so delicious. 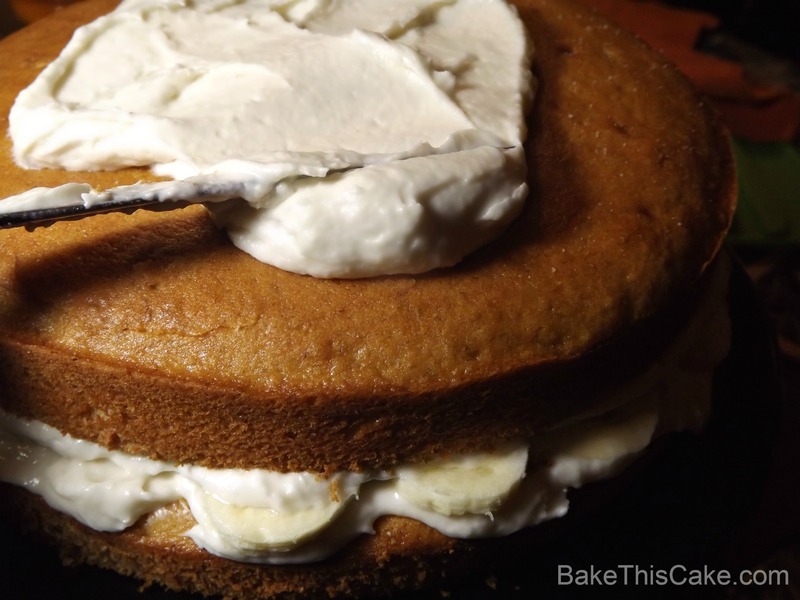 Adding banana to the frosting- what an awesome recipe! I did use coconut butter instead of butter just because I thought it would be good with the banana. But, I’m sure regular butter would taste great, too. 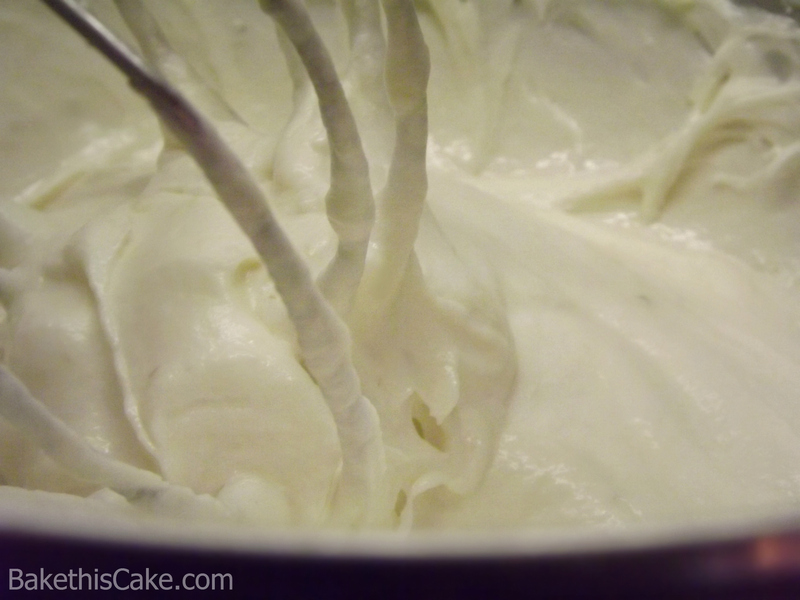 My Mother use to make a great banana cake with this type of frosting when I was a young girl, I always loved it. I have a vintage oatmeal cake recipe I believe on m pinterest Depression era recipes board if you wish to take a look. Thanks for sharing. I am going to use fondant over the cake, can i leave this cake out over night or should it be refrigerated? Perfect, I wanted to decorate the cake the night before, but I can not refrigerate fondant because it gets to tacky and sweats. 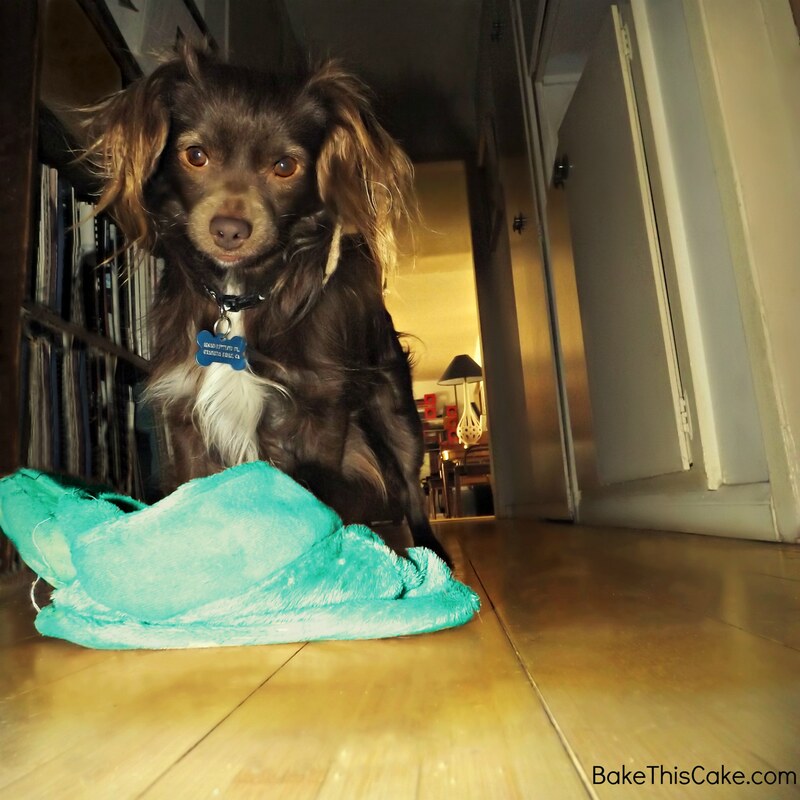 Just making sure the cake itself was ok to sit out over night. I will let you know how it turns out! Making the frosting to go along w/ the cake I’m making for the bfs birthday cake, but was wondering if this was a type of frosting that would melt or get droopy like a cool whip texture if we don’t eat it right away. Refrigerator safe for a cpl hours? 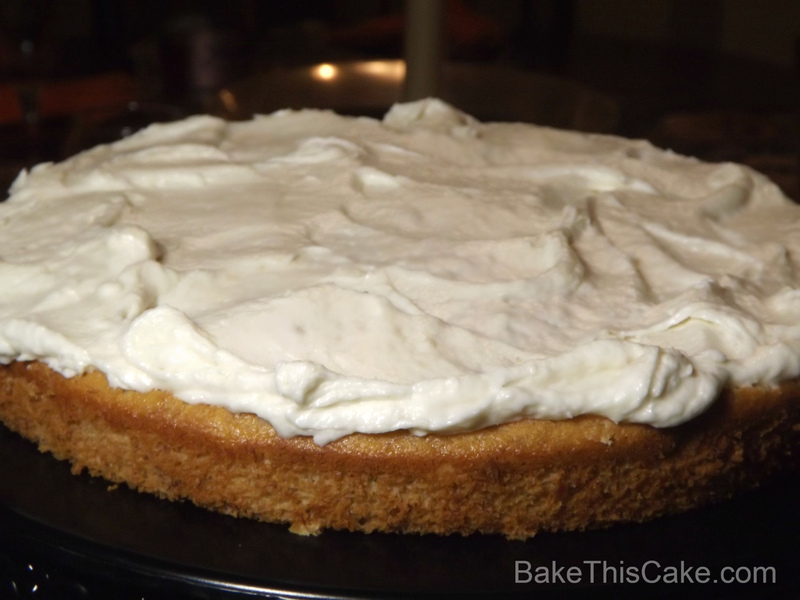 I usually frost this cake pretty close to serving time because of the fresh banana slices in the center filling and because it is a “soft” frosting, more creamy than stiff. I would chill it for a couple of hours of doing this beforehand. Let us know how it goes if you can. Happy birthday to your bestie! And happy banana layer cake baking! I liked your recipe and the pictures but I wanted to print the recipe and I did not want 30 pages of pictures to get a simple recipe. How about an update on your website for a printable recipe. was googling a banana frosting recipe and found your page. Amazing!! Thanks for showing in pictures how to do it! Hi, Sherry, Thanks for your comment. A printer version of this site is actually way off in the future at this point with too few hours in the day (and night). 🙂 In the meatime, I hope you’ll be able to try using a smart phone or an ipad or laptop on the counter as you bake for easy real-time scrolling while you work. You could probably cut and paste the sections into a word document, and print it that way. It may take a few minutes. I love seeing these comments. 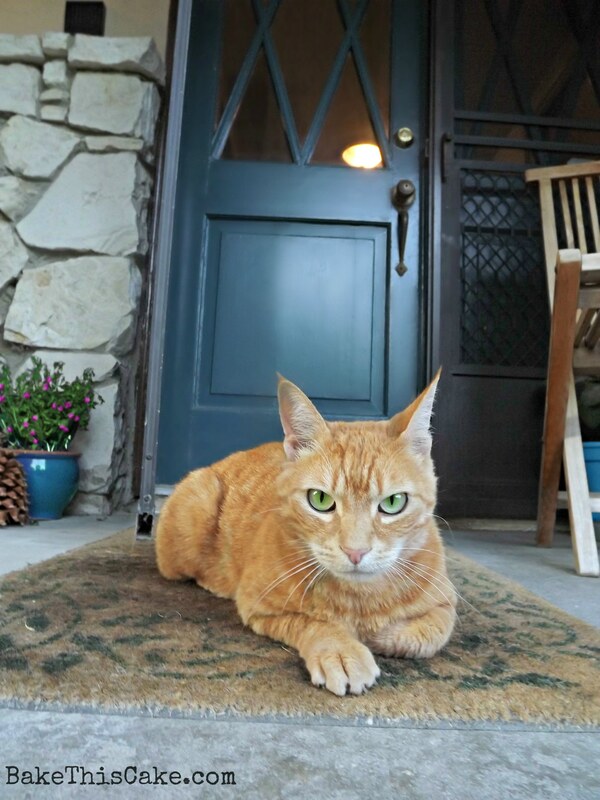 Today is my son’s 16th birthday. We are having brownies with banana frosting per his request. Looks like a few have tried this before. Wish us luck. I have been searching for this recipe for YEARS! When I was a little girl, my grandmother used to make this cake for my birthday. Before I was old enough to get her to write down her recipe (which was in her head), she had a stroke and was unable to communicate. This bring back precious memories. Now, can anyone find an old recipe for a delicious and moist Oatmeal Cake? My mother always made it in an 11″ x 14″ pan. Bananas brown when you use them in pudding will this happen in the frosting? Luckily, this creamy frosting turns out a lovely light pale yellow just like the photos.. Omg!! You inspired me to drive to the store & pick up 2 ingredients I was missing! My cake turned out absolutely delicious! It’s heavenly 🙂 & my husband loved it. Thanks for sharing this wonderful recipe :)♡♡ I’m now more inspired to try many more classic vintage cake recipes..also target sells Swans down cake flour which was great! This sounds delicious and looks easy (2 of my requirements!). What would you suggest be the measurements if I make cupcakes instead of a double layer cake? I’m not opposed to having leftover frosting, but just in case. My cake turned out perfect but my frosting was runny and not fluffy. Any suggestions? 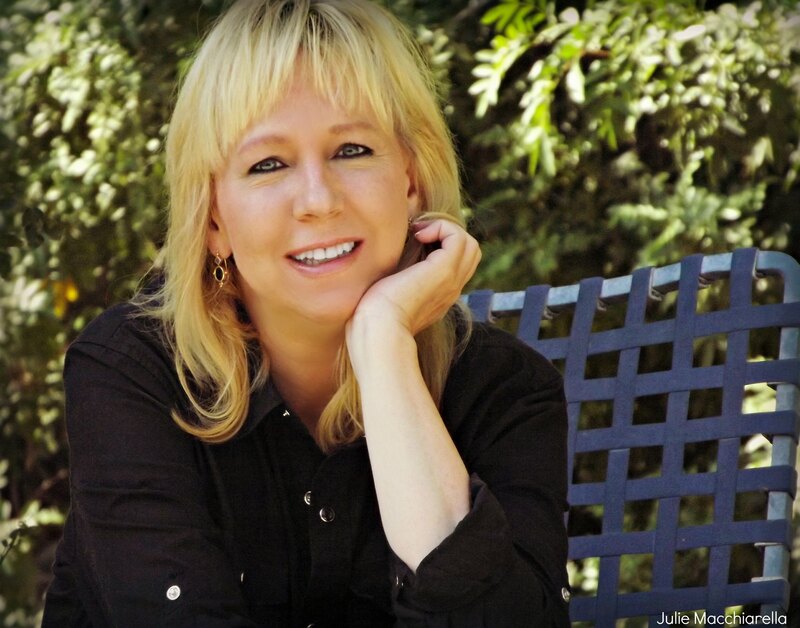 Hi, Julie. So glad your fresh banana cake turned out perfectly. Now to the frosting. 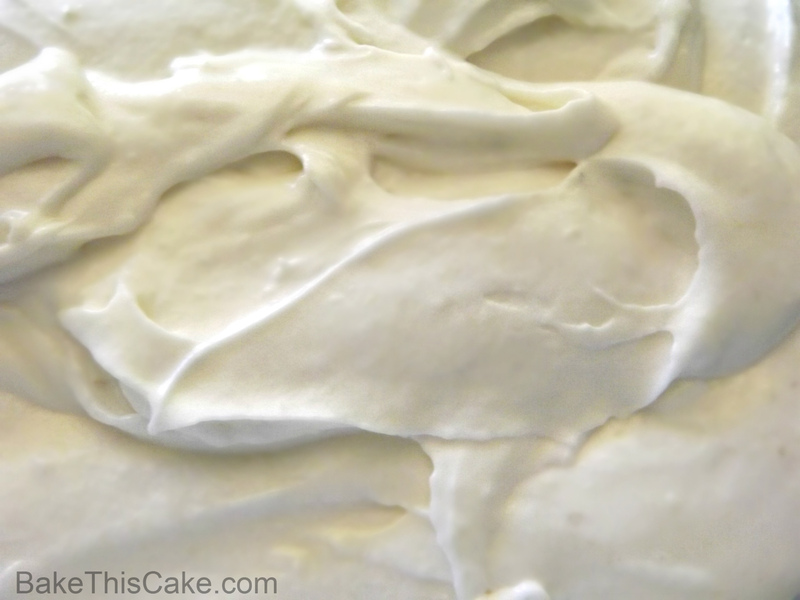 This frosting should have a smooth and creamy texture (as in the final photos) but it is not stiff or super fluffy like a bakery frosting (often made with vegetable-type shortening). Could it improve with a chill in the fridge and then a little more whipping (if the cream cheese and/or the butter was a little too warm)? Or perhaps just try adding in a little more sifted powdered sugar with a little more beating to get a thicker consistency. This looks amazing! How long do you think the frosting will last in the fridge? Have to go on a business meeting but will like to have my husband’s birthday cake done beforehand. Hi, Stephanie. I haven’t actually held this frosting for later use so you’ll be the trendsetter here. I’m guessing it will hold covered tightly in the fridge though you may have to let it sit on the counter a bit and give it a last minute beating. Happy birthday to hubbie! Using your frosting recipe on my daughter’s birthday cake! She will be 5 on May 6th and wanted a strawberry cake with banana frosting. Just tried this tonight ✌️ 16 year old birthday… Wanted a brownie cake with a layer of peanut butter with banana frosting. 🙂 This recipe came in very handy and tasted great. Wow, Melissa, that’s quite a combo. Sounds perfect for the adventurous teen. So glad you liked the fresh banana frosting and for your comment. I will be trying your frosting on Sunday. My daughter is turning 11 and she would like a chocolate banana cake. So I am making a chocolate cake with your banana frosting. I can’t wait to try it and have her as well. Thank you for the recipe. Happy birthday to your little one, Tanya. Thank you for stopping by. 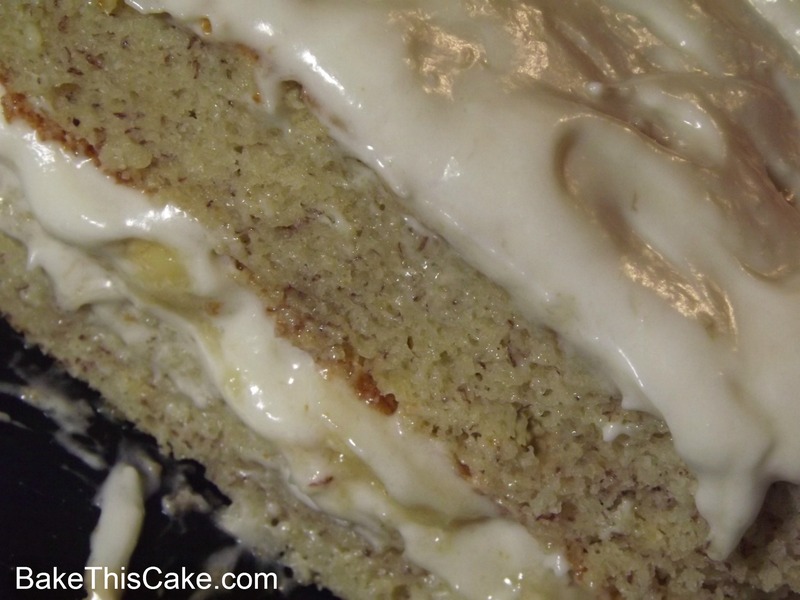 I SO love the idea of using the fresh banana frosting with a chocolate cake. Sounds like a wonderful cake duo to me. What’s the recipe to the banana cake? Only see frosting part. 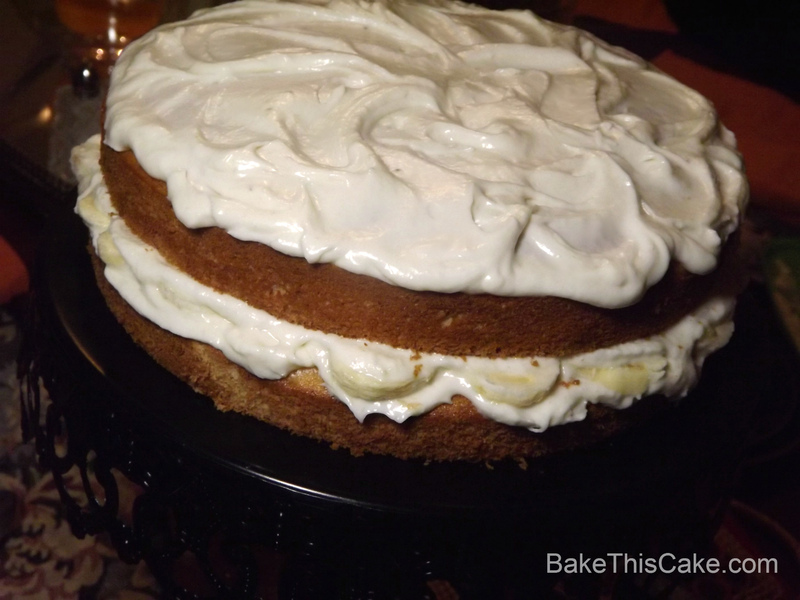 I made your banana cake & this frosting for my 55th birthday on March 25. I totally loved every single bite. The frosting is killer!!!! I can’t wait to try it out at my next church function. Thank you for sharing!! looks so yummy and i can’t wait to try the frosting as filling for my chocolate cake. can i also use this to ice whole cake and cover it with fondant? or this is too soft? What kind of dog is it? Its so cute! Hi Ann, This is Icarus, our little demon angel dog 🙂 He is an apple-head chihuahua who came to us in distress for bottle feeding and care at the tender age of 2 weeks. We adore him! I’ve been looking for a banana frosting for a long time. I will be using this one soon. This frosting was absolutely AMAZING! It had exactly the taste I’ve been longing for. I will definitely make this again. Thanks for visiting and I hope you enjoy the Outback Bushman Honey Wheat Bread. Please visit again and let me know if you enjoyed it.